Genz-123346 is a potent and selective glucosylceramide synthase inhibitor with potential anticancer activity. A novel semi-synthetic taxane with antitumor activity used for the treatment of castration-resistant prostate cancer. A microtubule inhibitor. Piperine, a natural alkaloid isolated from Piper nigrum L, inhibits P-glycoprotein and CYP3A4 activities with an IC50 value of 61.94±0.054 μg/mL in HeLa cell. Tariquidar methanesulfonate, hydrate is a potent and specific inhibitor of P-glycoprotein (P-gp) with the high affinity (Kd=5.1±0.9 nM). 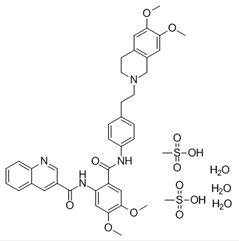 Zosuquidar (LY335979) is a potent negative modulator of P-glycoprotein-mediated multi-drug resistance with Ki of 60 nM. Elacridar is a P-glycoprotein and breast cancer resistance protein inhibitor that has been used to improve the brain distribution of drugs that are substrates of P-gp and BCRP. Elacridar Hcl (GF120918; GW0918) is a P-glycoprotein inhibitor, and has been used both in vitro and in vivo as a tool inhibitor of P-glycoprotein (Pgp) to investigate the role of transporters in the disposition of various test molecules.